Hey everyone! It's so good to be back! If you've been wondering what I've been up to during my absents check out this post. Thanks for joining me today for the March Papertrey Ink Senior DT Challenge. 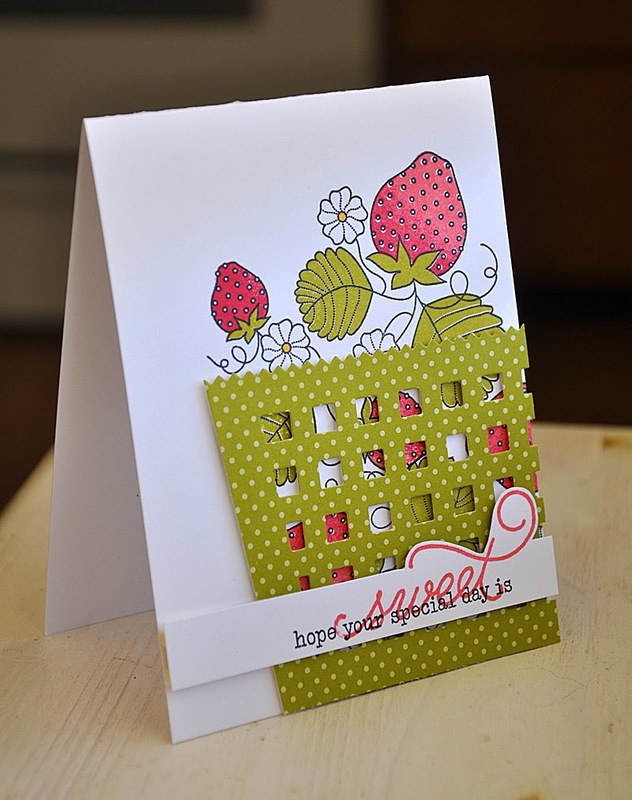 This time around we are bringing back Strawberry Patch and Strawberry Patch Sentiments! Spring is in the air! What a sweet treat you are in for today, as the Senior Design Team brings forth their best projects using the Strawberry Patch stamp sets. Like me, you too may be longing for warm spring days even more after today. Here are a couple cards I've created just for today. I hope you enjoy them. 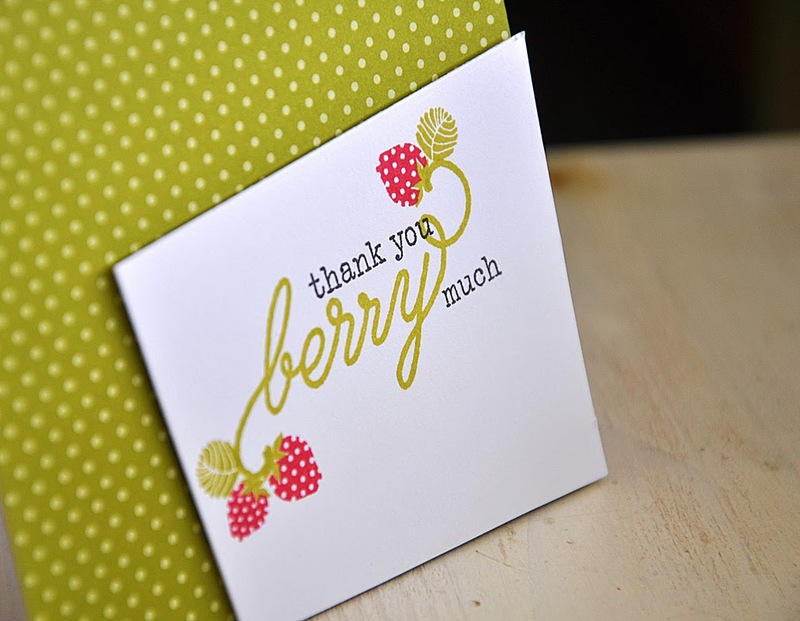 Here's a sweet and simple berry card. I whipped out the Berry Basket die just for this project. I die cut it from simply chartreuse pattern paper and only used a portion of it. I made sure to fill the basket with some very ripe berries, stamped in both berry sorbet and pure poppy inks, using the rock and roll technique. 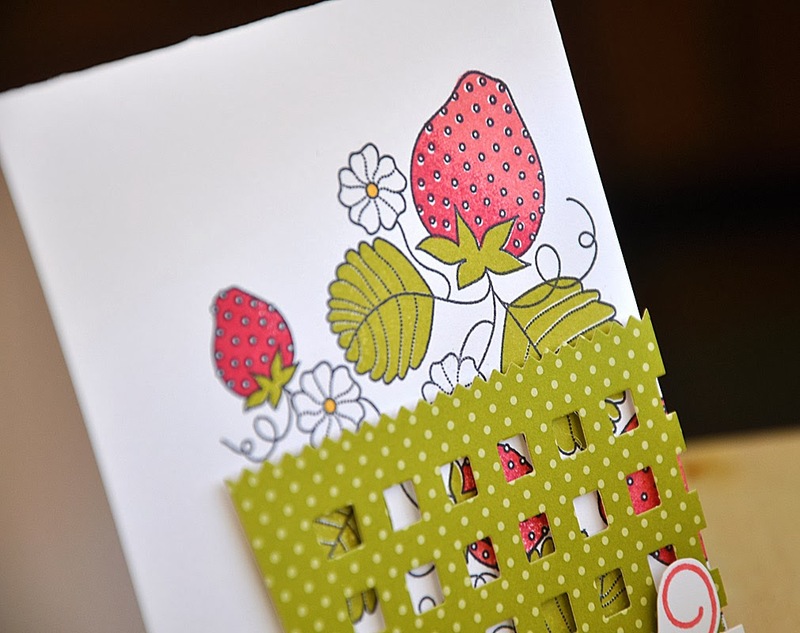 Then finished the card off with a Strawberry Patch sentiment, from the sentiment stamp set. I stamped the phrase at the bottom edge of white cardstock and trimmed by hand the top portion, giving this strip a whimsical touch. For my second project I whipped out a sweet sentiment and some tiny berries, also from the Strawberry Patch Sentiment stamp set. 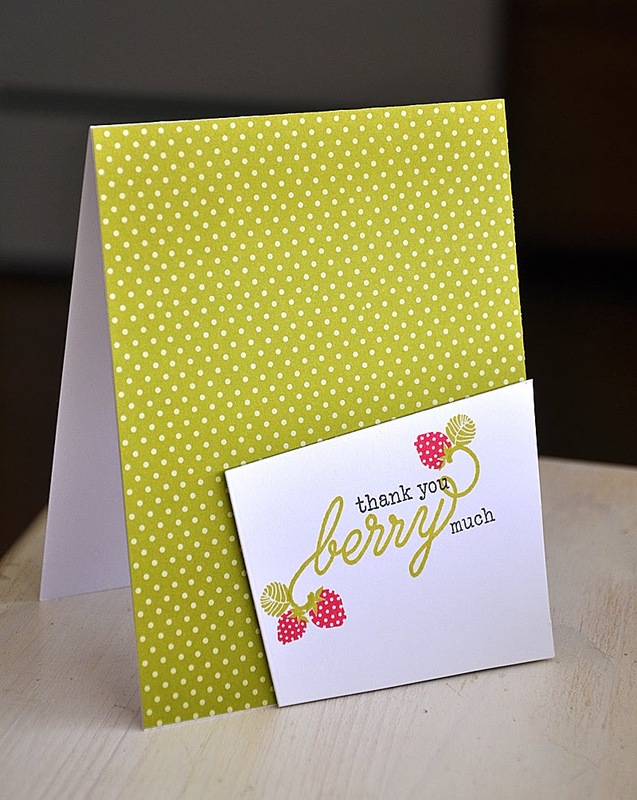 I embellished the twirly ends of "berry" with sprouting berries and leaves. Such a cute little touch. This was stamped onto the top portion of a die cut panel, die cut using the smallest die from the Tipped Tops die collection. Them mounted onto more simply chartreuse pattern paper. 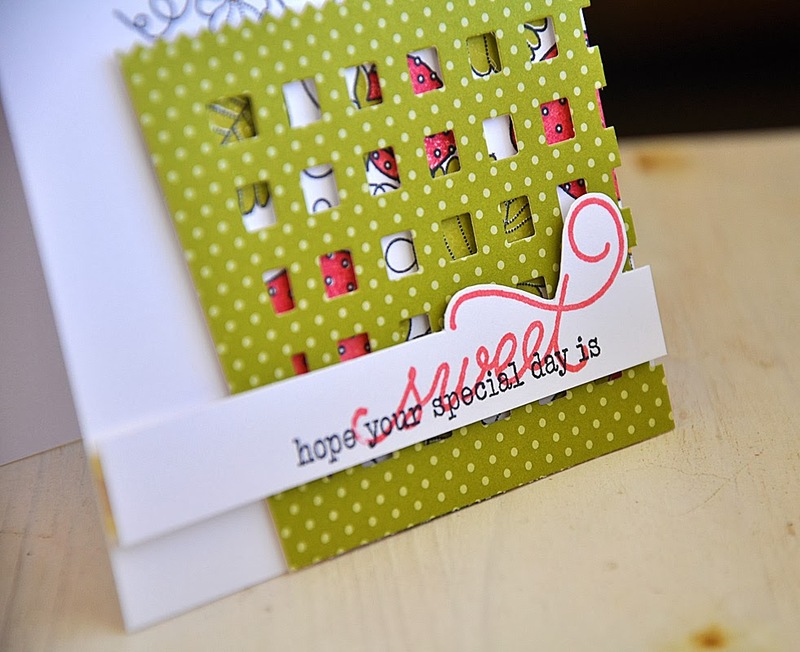 I love how you used the basket die on your card! What a wonderful idea for an unused die of mine... Thank you for your inspiration! I love love your clean and simple cards Maile!! I would have never thought to use the basket on a card!! Going to have to try that!! Welcome back! So glad to see you back, Maile! Congratulations on the newest addition to your family! Good to see you posting again. I love these cards. I never would have thought to use the basket on a card. Love the strawberries on the flourishes of your sentiment. Welcome back and congrats on your new addition!! Loves that basket die. Congrats to you! These cards are so cute! Love these cards! Great way to use the basket die! I love the basket you created for the card. I love the clean simple look of your 2nd card.